I have full control of my SharePoint 2016 Online collection site. I have a list with content types enabled. My 2 content types have a long list of columns (#1 = 111, #2 = 113 exactly). I have a default content type for a new form, while the other is not allowed on a new form. The default edit form hasn't been tampered with. My problem: when I want to edit an item, only one content type is shown (#1). Why can't I choose #2? And most importantly, how to fix it? I did some search (Google and StackExchange) without any luck. Am I the only one this kind of thing happens? To my future savior, I will eternally be grateful. 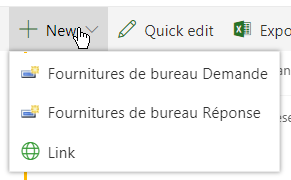 I hope in the future Microsoft will give the opportunity to have content types visible only when editing an item. First of all check the "Change new button order and default content type" settings. To use the content type while editing the item, the corresponding content type should be checked(Visible). So in your case, please make the content type (which is not allowed on new form) as visible. Yes apparently this is how it works. If you uncheck the visibility of the CT from the "New" button order menu in the list settings, it disappears from the default edit form as well. I have tried this in a classic library view and the behavior is the same. In classic view the content type drop down gets hidden. Not the answer you're looking for? Browse other questions tagged sharepoint-online content-type edit-form or ask your own question. How to Create a View of a Particular Content Type when there are Mulitple Content Types? EditForm and ContentTypes -> can I edit a list item using a different ContentType than what it was created with?